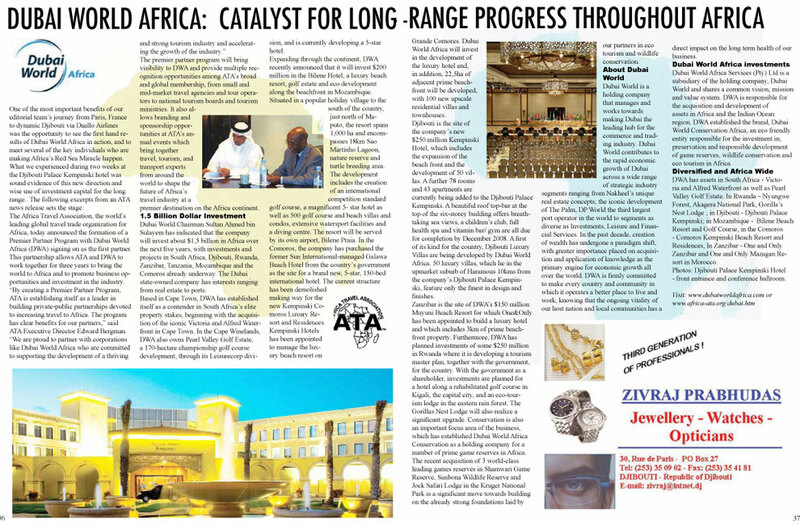 Dubai World Africa Profile ( from two page spread above). One of the most important benefits of our editorial team's journey from Paris, France to dynamic Djibouti via Daallo Airlines was the opportunity to see the first hand results of Dubai World Africa in action, and to meet several of the key individuals who are making Africa's Red Sea Miracle happen. What we experienced during two weeks at the Djibouti Palace Kempinski hotel was sound evidence of this new direction and wise use of investment capital for the long range.. The following excerpts from an ATA news release sets the stage:The Africa Travel Association, the world's leading global travel trade organization for Africa, today announced the formation of a Premier Partner Program with Dubai World Africa (DWA) signing on as the first partner. This partnership allows ATA and DWA to work together for three years to bring the world to Africa and to promote business opportunities and investment in the industry. "By creating a Premier Partner Program, ATA is establishing itself as a leader in building private-public partnerships devoted to increasing travel to Africa. The program has clear benefits for our partners," said ATA Executive Director Edward Bergman. "We are proud to partner with corporations like Dubai World Africa who are committed to supporting the development of a thriving and strong tourism industry and accelerating the growth of the industry." The premier partner program will bring visibility to DWA and provide multiple recognition opportunities among ATA's broad and global membership, from small and mid-market travel agencies and tour operators to national tourism boards and tourism ministries. It also allows branding and sponsorship opportunities at ATA's annual events which bring together travel, tourism, and transport experts from around the world to shape the future of Africa's travel industry at a premier destination on the Africa continent. Dubai World Chairman Sultan Ahmed bin Sulayem has indicated that the company will invest about $1,5 billion in Africa over the next five years, with investments and projects in South Africa, Djibouti, Rwanda, Zanzibar, Tanzania, Mozambique and the Comoros already underway. The Dubai state-owned company has interests ranging from real estate to ports. Based in Cape Town, DWA has established itself as a contender in South Africa's elite property stakes, beginning with the acquisition of the iconic Victoria and Alfred Waterfront in Cape Town. In the Cape Winelands, DWA also owns Pearl Valley Golf Estate, a 170-hectare championship golf course development, through its Leisurecorp division, and is currently developing a 5-star hotel. Expanding through the continent, DWA recently announced that it will invest $200 million in the Bilene Hotel, a luxury beach resort, golf estate and eco development along the beachfront in Mozambique. Situated in a popular holiday village to the south of the country, just north of Maputo, the resort spans 1,000 ha and encompasses 18km Sao Martinho Lagoon, nature reserve and turtle breeding area. 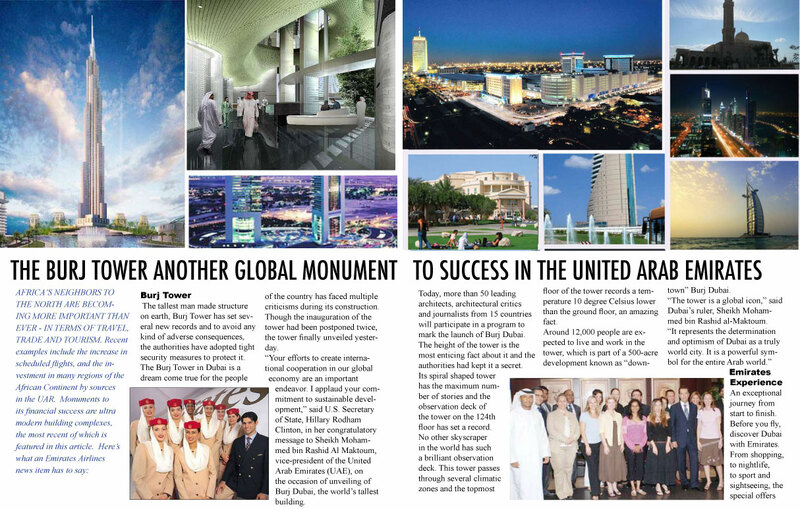 The development includes the creation of an international competition standard golf course, a magnificent 5- star hotel as well as 500 golf course and beach villas and condos, extensive watersport facilities and a diving centre. The resort will be served by its own airport, Bilene Praia. In the Comoros, the company has purchased the former Sun International-managed Galawa Beach Hotel from the country's government as the site for a brand new, 5-star, 150-bed international hotel. The current structure has been demolished making way for the new Kempinski Comoros Luxury Resort and Residences. Kempinski Hotels has been appointed to manage the luxury beach resort on Grande Comores. Dubai World Africa will invest in the development of the luxury hotel and, in addition, 22,5ha of adjacent prime beachfront will be developed, with 100 new upscale residential villas and townhouses. Djibouti is the site of the company's new $250 million Kempinski Hotel, which includes the expansion of the beach front and the development of 50 villas. A further 78 rooms and 43 apartments are currently being added to the Djibouti Palace Kempinski. A beautiful roof top-bar at the top of the six-storey building offers breathtaking sea views, a children's club, full health spa and vitamin bar/ gym are all due for completion by December 2008. A first of its kind for the country, Djibouti Luxury Villas are being developed by Dubai World Africa. 50 luxury villas, which lie in the upmarket suburb of Haramous 10kms from the company's Djibouti Palace Kempinski, feature only the finest in design and finishes. Zanzibar is the site of DWA's $150 million Muyuni Beach Resort for which One&Only has been appointed to build a luxury hotel and which includes 3km of prime beachfront property. Furthermore, DWA has planned investments of some $250 million in Rwanda where it is developing a tourism master plan, together with the government, for the country. With the government as a shareholder, investments are planned for a hotel along a rehabilitated golf course in Kigali, the capital city, and an eco-tourism lodge in the eastern rain forest. The Gorillas Nest Lodge will also realize a significant upgrade. Conservation is also an important focus area of the business, which has established Dubai World Africa Conservation as a holding company for a number of prime game reserves in Africa. The recent acquisition of 3 world-class leading games reserves in Shamwari Game Reserve, Sanbona Wildlife Reserve and Jock Safari Lodge in the Kruger National Park is a significant move towards building on the already strong foundations laid by our partners in eco tourism and wildlife conservation. Dubai World is a holding company that manages and works towards making Dubai the leading hub for the commerce and trading industry. Dubai World contributes to the rapid economic growth of Dubai across a wide range of strategic industry segments ranging from Nakheel's unique real estate concepts; the iconic development of The Palm, DP World the third largest port operator in the world to segments as diverse as Investments, Leisure and Financial Services. In the past decade, creation of wealth has undergone a paradigm shift, with greater importance placed on acquisition and application of knowledge as the primary engine for economic growth all over the world. DWA is firmly committed to make every country and community in which it operates a better place to live and work, knowing that the ongoing vitality of our host nation and local communities has a direct impact on the long term health of our business. Dubai World Africa Services (Pty) Ltd is a subsidiary of the holding company, Dubai World and shares a common vision, mission and value system. DWA is responsible for the acquisition and development of assets in Africa and the Indian Ocean region. DWA established the brand, Dubai World Conservation Africa, an eco friendly entity responsible for the investment in, preservation and responsible development of game reserves, wildlife conservation and eco tourism in Africa. Diversified and Africa WideDWA has assets in South Africa - Victoria and Alfred Waterfront as well as Pearl Valley Golf Estate. In Rwanda &endash; Nyungwe Forest, Akagera National Park, Gorilla's Nest Lodge ; in Djibouti - Djibouti Palace Kempinski; in Mozambique - Bilene Beach Resort and Golf Course, in the Comoros - Comoros Kempinski Beach Resort and Residences, In Zanzibar - One and Only Zanzibar and One and Only Mazagan Resort in Morocco.Photos: Djibouti Palace Kempinski Hotel - front entrance and conference ballroom. ATTENTION MEMBERS! OUR EDITORS ARE ANXIOUSTO HEAR FROM YOU -please e mail us now. King Abdullah II of Jordan on World Peace . Qatar Air Expands in USA . Qatar Air to Lagos . 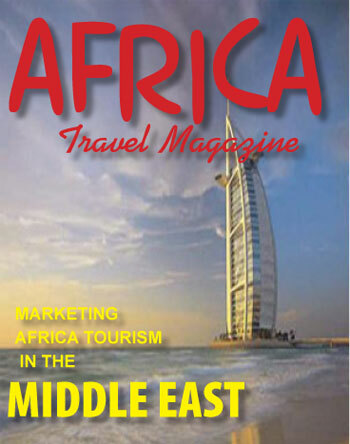 This Site is #1 and #2 on Google for ªMarketing Africa Travel to Middle East "
Don't Forget! Jordan VideoAds, a Great Marketing Tool! The Jordan Tourism Board is now promoting Jordan more effectively and efficiently with VideoAds, driving lead generation through rich storytelling, and measuring and optimizing our online marketing efforts (from impressions, to views, to actions, to where viewers are coming from &endash; anywhere around the world) with measured results. It is a pleasure for me to address you today, at the launch of an important and significant initiative in the tourism industry, the formation of the Tourism Investment Corporation, or Tourvest. Tourvest, the first non-hotel group focused exclusively on the tourism sector to be listed on the JSE, can indeed play a major role in the South African tourism industry.While there are a handful of terribly misguided souls who appear bent on scaring away tourists and international investors by spreading lurid stories about this country, the tourism industry continues to grow from strength to strength. South Africa is experiencing a massive tourism boom, as thousands of visitors flock to our shores. South Africa has now outstripped all other countries on the continent, save Egypt, as a tourist destination. Foreign tourism has grown 16% in real terms over the past six to nine years, well above the international average... continued. Jordan was the first country in the Middle East to adopt a national migrant and stop in the reserve during their annual trip between Europe and Africa.Royal Jordanian Airways, the national airline links Amman with most capitals in Europe, Middle East, Asia, and the Americas . Air France, KLM, Austrian Airways, Al Italia, Tarom, CSA, and Turkish Airlines are other options.